Great seats today and only £62 each. Wales pricing out the man on the street, take a leaf out of Scotland’s book. Glad we came to Scotland to see the Blues beat Edinburgh. Blues wanted to win more than Wales this weekend. What a game! Great come back by the Blues, well done the boys. We had great support in Myreside this evening. My voice has gone, shouted so much. Hoping Wales make it win number 2 tomorrow, the drive home on Sunday would be so sweet after two wins! Just a short time before kick off, hope it is a fast running game, it’s a little cold in Myreside. Not quite up to the standard of the Arms Park! Finally arrived at camp for the next two nights, having visited Gretna Green and the Falkirk Wheel enroute. Looking forward to our first visit into Endinburgh, this evening, for the Blues match – C’mon the Blues! Thank you storm ‘Doris’. It has taken eight and a half hours to get to first night stop in Carlisle. Did stop in Holmes Chapel for lunch at the George and Dragon. Couldn’t get to the pub we originally intended to go to because a tree was blocking the road but we ended up having a great meal! Detour on M6 took us via the outskirts of the Trafford Centre but we didn’t stop. Not enough time! 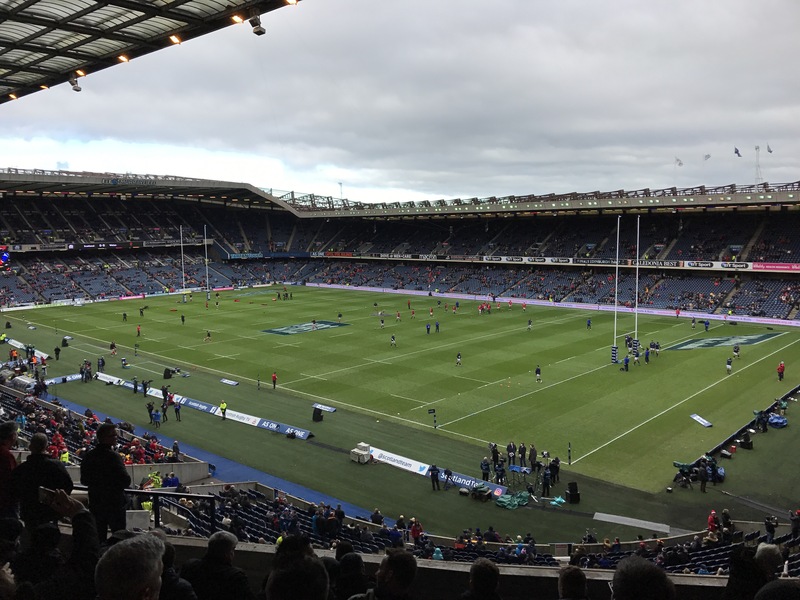 Looking forward to watching Edinburgh v Blues tomorrow night – good to see only two changes from last weeks team. Cuthbert playing too – C’mon the Blues! Looking forward to this weeks road trip – off to Edinburgh for two big games. All starts on Friday night, Edinburgh v Cardiff Blues. Let’s hope the Blues can continue their second half form of last weekend but this time for the full 80 minutes. Then on to Scotland v Wales the next day – Wales must return to winning ways, the Championship title is still on! Well done Cardiff Blues, a great second half effort and some good tries. A special well done to Alex Cuthbert, fantastic run down the right wing to set up a try for Willis Halaholo. Cuthbert’s try, the last for the Blues, summed up a good performance and should silence his critics, at least for an hour or two. Cuthbert deserved the standing ovation that he received. Final score 57 points to 20, a well worked and deserved result. Looking forward to watching the Blues in Edinburgh next Friday night. C’mon the Blues! !